We were shocked and saddened by the sudden death of our mission’s owner, Bishop Michael J. Kaniecki, SJ, who collapsed from a massive heart attack August 6th. Tom and Florence Busch flew to Fairbanks for Bishop Mike’s funeral Mass and burial, and Tom was one of four people who were asked to offer brief eulogies at the Mass. Please join us in prayer for the repose of the soul of this remarkable man. PILGRIMAGE; Nome pastor Father John Hinsvark administers Holy Communion to King Island Eskimo Michael John Mayac. Father John was celebrating Mass in the old chapel at Pilgrim Hot Springs, a former Jesuit mission about 50 miles north of Nome. The Mass followed an eight-mile pilgrimage, part of the parish’s celebration of the Jubilee Year. 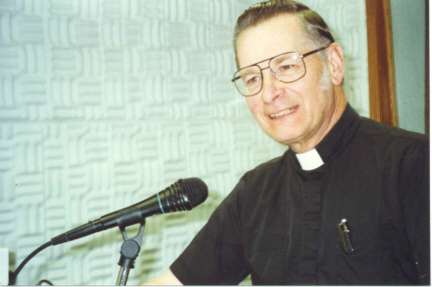 Using a satellite telephone, KNOM broadcast this very special Mass throughout western Alaska. Please look for details below. THERE ISN’T A CATCH and that’s the problem. Throughout the Yukon River and Norton Sound, the heart of KNOM country, salmon fishing continued to be disastrous this summer. Many families caught no fish at all. Nobody knows why the salmon are dwindling so catastrophically. This year’s fall chum salmon run was 10% of what was considered normal twenty years ago. Please continue to pray. WELCOME to new volunteer Andrew McDonnell, fresh from South Bend, Indiana. Within two weeks, he was announcing the morning show like an old hand. Welcome aboard! ALL WET…BUT REALLY COOL: Nome’s late summer was unusually rainy, foggy and drizzly, with temperatures mostly hovering between +45° and +55°. No snow yet, though we were pelted by an ice storm on July 28th. INSPIRATIONAL SPOT: Let everything in you come from the Holy Spirit. Everything which flows from this Spirit is gentle, mild, modest and humble. On the feast of the Transfiguration, August 6th, Bishop Michael J. Kaniecki, SJ suddenly felt ill in the remote Yukon Delta village of Emmonak (eh-MAHNG-uk, in KNOM country, 120 miles south of Nome). He was about to celebrate Mass and administer the sacrament of Confirmation to two dozen village youth. The bishop went for a walk in the fresh Alaska air, and abruptly fell to his knees and collapsed onto the dirt street. Witnesses ran for their pastor, Fr. Tom Provinsal, SJ, who administered the Sacrament of the Sick moments before the bishop died on the village street. He was 65 years old. Everyone who knew him was shocked, as up to his last moments he had appeared to be robust and strong. 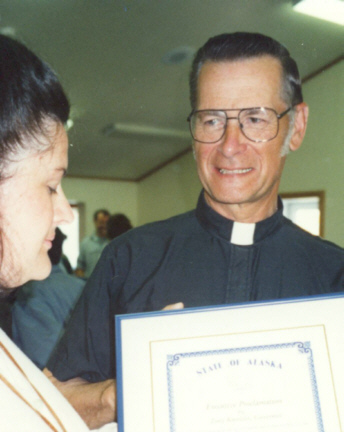 As Catholic Bishop of Northern Alaska, he was owner of KNOM, and took pride in that fact. Officially, in his own documents and in the “Nome Static,” the bishop insisted that he be mentioned by his full name. However, he made it clear to old friends that in private, he wished to be simply known as “Mike.” Most of us alternated that with “Bishop Mike,” in respect for the office. Father Kaniecki accepted the post of bishop reluctantly. Following his appointment, I interviewed him over KNOM, and after the interview, we chatted for a long time. He was very humbled. It was clear that he didn’t feel up to the demands of the job. Of course, he proved himself more than able. I knew Mike for almost thirty years. 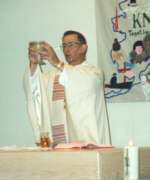 When we met, he’d been a priest for six years, and was pastor at Kotzebue (KAHT-zeh-byoo), 180 miles north of Nome. Kotzebue drew its water from the surface of the tundra, and in the rectory, Mike proudly displayed a drinking glass. He’d filled the glass and let the water evaporate, and as a result, the glass was filled with filaments of black, greenish gunk. 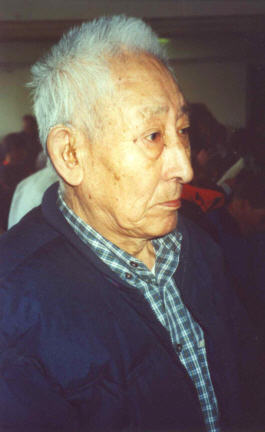 “Kotzebue water is a meal in itself,” he laughed. 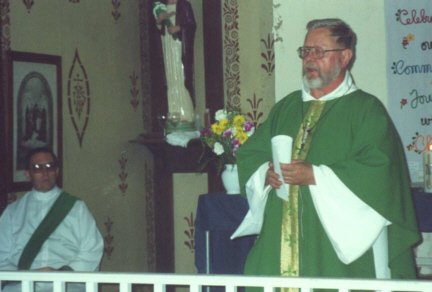 (Left) Bishop Kaniecki celebrates Mass on KNOM’s 25th birthday, July 14, 1996. Mike loved the wilderness of Alaska and he loved its people. He was a genuine shepherd, a prayerful man who really cared about his flock. As bishop, he flew around the world, and always returned exhausted. But he never tired of flying his airplane into the many villages of his diocese to spend time with his people, all of whom loved him in return. As an administrator, he was ruthless, determined to put this missionary diocese on a firm footing. But he would punctuate every telephone call with a corny joke. Last year, I suggested to Mike how much easier things would be for us if we had a long term financial safety net for the diocese, and for the KNOM mission. Mike disagreed. “The Lord wants to keep us hungry,” he said. I have never seen Bishop Mike as relaxed as when he visited Nome on a Jubilee pilgrimage this past spring. Bishops don’t have many people with whom they can share their frustrations, and as he had a few times in the past, without breaking confidences, Mike shared with me many of the burdens he bore as bishop. I told him that I didn’t envy him. This spring, he enjoyed hanging out with the volunteers and occupying long evenings with us and with other old friends. The new volunteers were delighted and dumbfounded to spend so much informal time with a bishop. Florence and I, well, we have always greatly enjoyed Mike’s company. I last saw Mike in June, on the miraculous day that he ordained Ross Tozzi to the deaconate. The night before, we’d shared a quiet dinner at a friend’s house. It was clear that Mike had suffered several difficult, tense days, I don’t know why. He was lying back in an easy chair, trying to relax. “Mike,” I said on a humorous whim, “you are doing a great job.” He laughed, and I realized that few people told him that. They weren’t my last words to him, but almost. And yes, he did do a great job, an astonishing job, for fifteen years, carrying the heavy burden of Catholic Bishop of Northern Alaska. A day after his death, Florence and I were surprised to find ourselves weeping uncontrollably at Mass in Nome. Bishop Mike, we miss you. JUBILEE INSPIRATIONAL SPOT: If you can’t sleep, don’t count sheep…talk to the Good Shepherd. top The St. Joseph’s Parish Jubilee Year pilgrimage began fifty miles north of Nome. Worshipers walked eight miles, praying the Stations of the Cross through drizzle and rain on the narrow access road to Pilgrim Hot Springs (left). 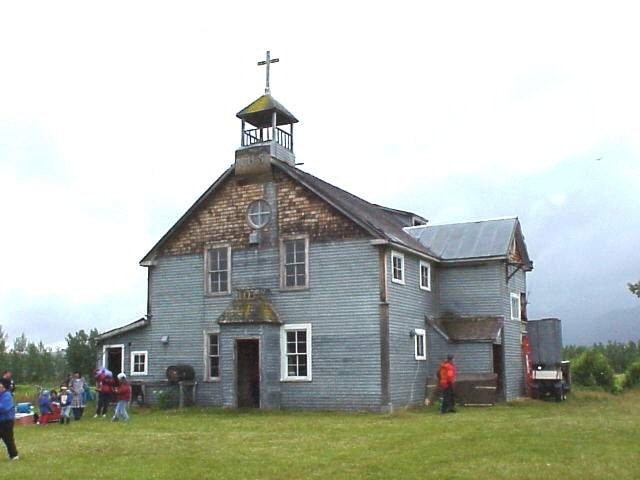 For Nome Catholics, the site was the perfect location for a pilgrimage. HISTORY: Pilgrim Hot Springs lies in a great, low, swampy tundra basin, 12 feet above sea level. Because of its geothermal springs, the site is relatively lush, with ferns and birch trees, an oasis on the otherwise featureless tundra. The property was given to the Catholic Church in 1917. Soon, pioneer missionary Fr. Bellarmine LaFortune, SJ began to move the nearby Our Lady of Lourdes Mary’s Igloo mission to Pilgrim with the intention of creating an orphanage. Coincidentally, the following year, the worldwide flu epidemic decimated Alaskan villages, and LaFortune accepted the first orphans in August of 1919. The orphans helped develop large fields, where the mission grew vegetables. On one side of the property, the Pilgrim River provided ample fish, and the area was also excellent for the hunting of moose. (Left) King Islander John Taxac joined the worship. An orphan, John was raised at the Pilgrim mission in the 1920’s. Jesuit priests and brothers and Ursuline sisters operated the mission until 1941, when it closed, due to the small number of orphans, as well as the poor repair of the buildings. Further, since the mission was located on vast, open tundra, there was no nearby source of firewood. 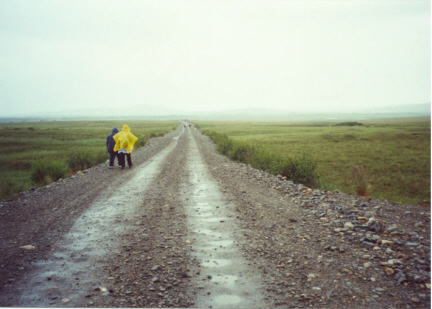 THE PILGRIMAGE: Pilgrims left Nome at 7:30 AM and fifty miles of rough road later, began the walk at 9 AM. By 12:30 PM, all walkers had prayed the Stations of the Cross and had reached the entrance to the hot springs, a long, sandy stretch of road that is also used as a runway. Many parishioners drove all the way into Pilgrim, but almost everyone walked the final two hundred yards, as the last portion of trail is extremely swampy and treacherous for vehicles. (Left) Our Lady of Lourdes chapel, as it stands today. Ham radio operators from KNOM and the parish handled communications, including discussion of how to transport elders that final distance. The KNOM 4-wheel drive Toyota was selected, and Tom Busch carefully navigated the sloppy path. Virtually the entire parish packed the upstairs chapel. There were chairs for older folks, but for most, the 82-year-old floor served just fine. Rain dripped through the roof and onto a corner of the altar and onto a few heads, but there were no complaints. The theme of the pilgrimage was forgiveness and healing. Father John Hinsvark celebrated a memorable Mass, one of the few times Mass has been offered in the chapel in almost sixty years. THE KNOM BROADCAST: Pilgrim is 50 miles from the nearest telephone. Because of its low elevation, and the 3,500-foot mountains between it and Nome, it’s impossible to get a live signal from Pilgrim using ordinary means. As we wrote in the May “Nome Static,” we leased an International Marine Satellite (“INMARSAT”) telephone, at a cost we originally estimated to be $2,900. Satellite time is more expensive than we’d planned, and the final bill will be somewhat higher. Engineer Les Brown set the satellite antenna on an old water tank platform, and placed the equipment in the chapel’s old sacristy. Les beamed the signal to a satellite over the Pacific Ocean. The signal was downlinked in Perth, Australia and routed to France, the Lower 48, and then to Nome. The hour-long broadcast worked perfectly! We offer our sincere thanks and prayers to the special friends who made this historic spiritual broadcast possible. (Left) Father John preaches the homily, while deacon Ross Tozzi watches. JUBILEE INSPIRATIONAL SPOT: We do not gather for Mass to watch it happen, we go to make it happen. We are the Body of Christ, and what happens at liturgy occurs because we are in the four-fold presence of Christ… the Eucharistic bread and wine, the Word, the minister, and God’s beloved children. 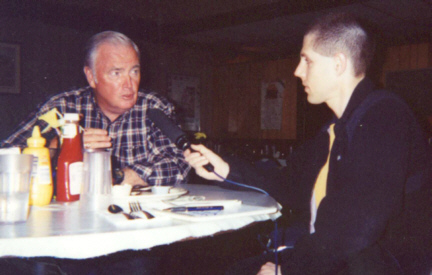 top ON THE RUN (left): KNOM news director Paul Korchin catches a quick, but very substantive, interview with U.S. Senator Frank Murkowski. The senator was in Nome for only a few hours. While he didn’t have time to travel to the KNOM studio, Senator Murkowski agreed to talk during breakfast at “Fat Freddie’s” Restaurant downtown. THIRTY YEARS AGO: September 10, 1970, Bureau of Indian Affairs Commissioner Morris Thompson signed off on paperwork that allowed KNOM to begin work at the remote transmitter site (although it was more than three years before the actual papers came through.) We began digging the next day. The tower needed an excavation that was eight feet wide by a minimum of 15 feet deep. The frozen permafrost was hard as concrete, and after a backbreaking ten days swinging picks, volunteers John Pfeifer and Tom Busch had progressed less than six feet down. September 20th, Nome’s dormant mining company lent the mission its “powder monkey” Sam Tucker. Sam drove to the site in his rickety pickup truck, with Pfeifer and Busch in back, sitting atop cases of dynamite with blasting caps jingling in their pockets. At Sam’s direction, the two maintained a driftwood fire, heating immense steel chisels until they glowed red, and with sledgehammers, pounded the sizzling chisels into the permafrost. The typical result of an hour’s work was a hole one foot deep, wide enough to stick a fist into. Sam would pack the hole with dynamite and ka-boom! They worked 12-hour days, 7 days a week. Watch for a photo next month. As September 1970 ended and the first flakes of snow fell, the holes were only a fraction of what they needed to be. While everyone believed that KNOM had lost the construction season, no one was willing to give up. Meanwhile, the mission had applied for the call letters KNOM and learned that they were already assigned to the Coast Guard schooner “Chiquimula,” which had been scuttled. The military relinquished the calls, and they were assigned to the new Catholic station on September 26th. THANK YOU AGAIN for your faith and your support for our mission. It is you who keeps our mission radio station alive and strong. Please continue to keep us in your prayers, and be assured of ours in return. May God greatly bless you! Beaming God’s Love throughout Arctic Alaska since 1971...thanks to you. JUBILEE INSPIRATIONAL SPOT: When most folks talk about forever, they usually think about the future. But our forevers are determined by the way we live today. Your forever begins right now. INSPIRATIONAL SPOT: Aim for perfection. You'll find that it's a moving target!